We are having a magnificent September in Alberta. We haven't seen a cloud for a month, and daily temperatures have been in the 20’s C (80's F). Evenings are warm enough to sit on the deck. Fall migration has been in full swing for the past few weeks. Shorebirds, warblers and other songbirds have moved through, with a few stragglers still hanging around. Northern sparrows are here in good numbers now. On the flip side, there have already been a few reports of Common Redpolls, Purple Finches and crossbills, which only visit here during the winter months. With all this feathered activity, have I spent all my time in the field? Unfortunately, no. Running a small business plus a non profit organization, and moving our niece into the house to attend university took care of that. My birding time has sadly been spent reading the local bird alert and birding blogs. Frantically casting my thoughts around for a topic to write about this month, I remembered a tour we had taken last year at this time, and decided fond memories were better than no post at all! 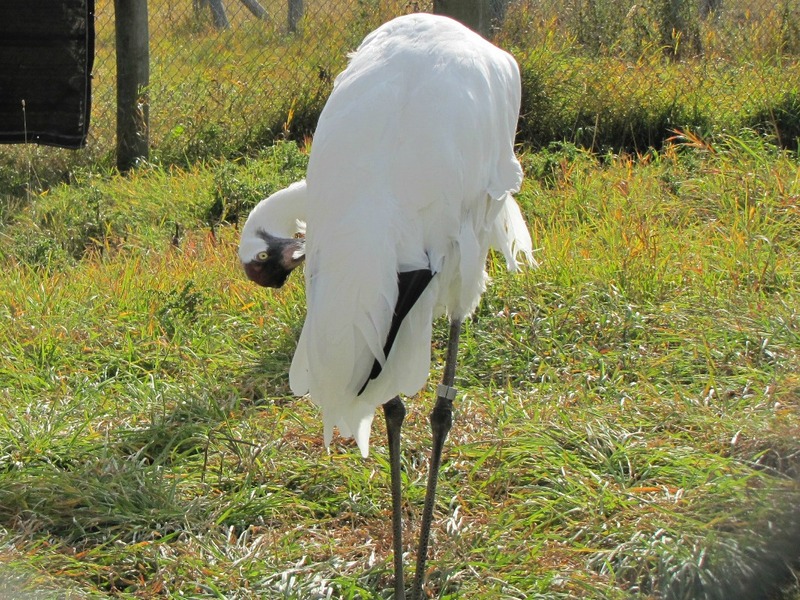 North America’s largest bird, Whooping Cranes stand about 5 feet (1.5 m) tall. Their wingspan is 6.5 ft (2 m) or more between the tips of their long black flight feathers. At close range, adult whoopers are imposing birds, with snowy-white plumage, black bristle-like feathers on crown and face, a small black patch on the back of the head below the crimson crown, and bright yellow eyes. They get their name from a distinctive whooping call that carries over long distances. 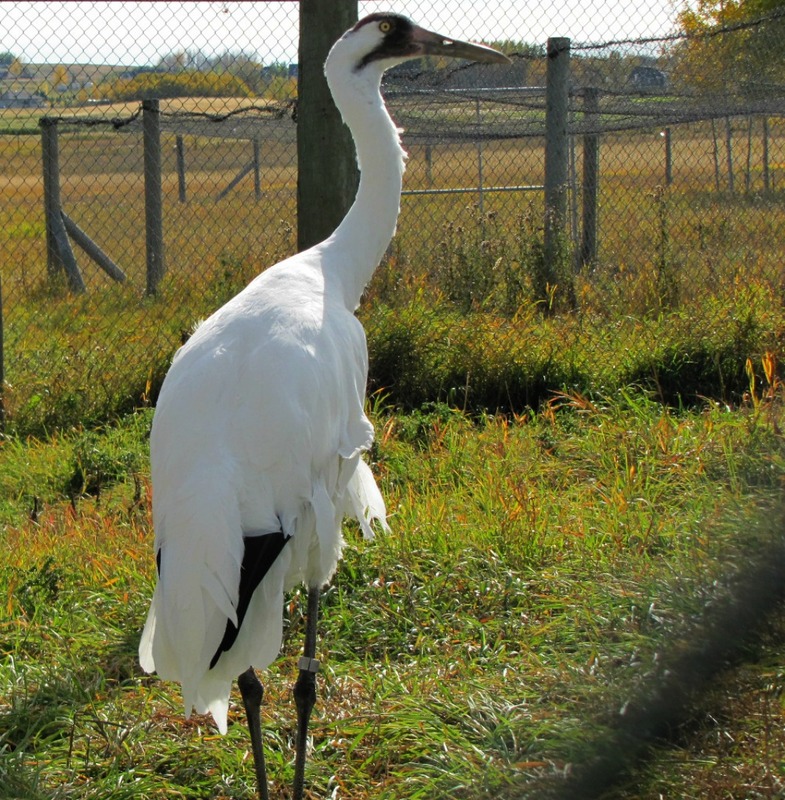 Located half an hour south of Calgary, the Devonian Wildlife Conservation Centre (DWCC) has been breeding Whooping Cranes since 1993, when the entire population was estimated to be 150 birds. 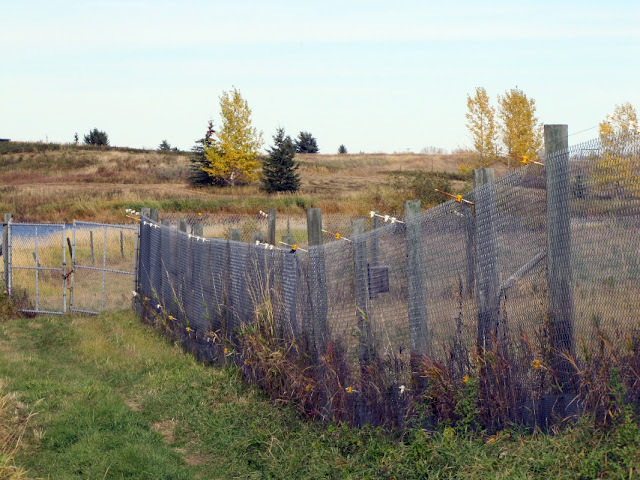 Owned by The Calgary Zoo, this half-acre facility is not open to the public but occasionally they allow limited tours through the local naturalist club. 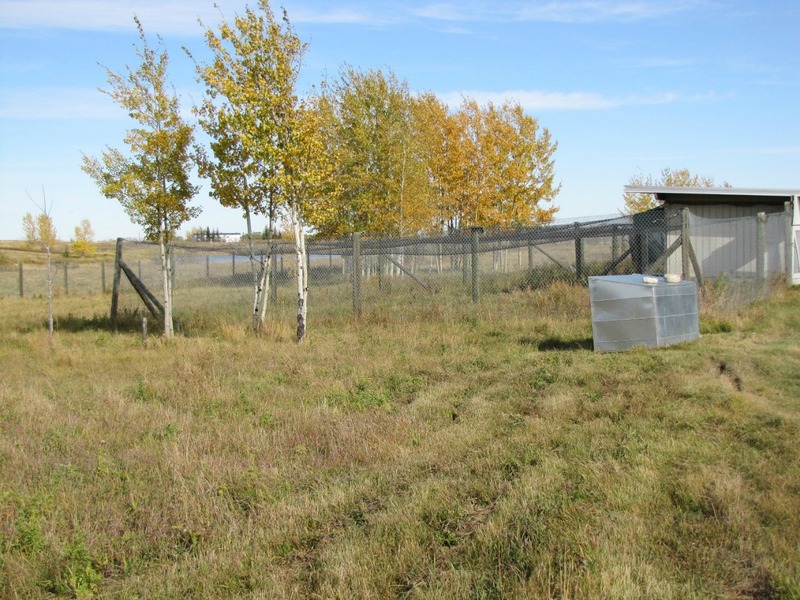 Captive breeding at this facility and subsequent reintroduction of the birds has played an important role in the recovery of the whooper population. At the DWCC, the Whooping Crane enclosures are isolated from the other animals, and surrounded by an electric fence with a locked gate. To keep coyotes from digging their way to these highly endangered birds, wire has also been buried to a depth of four feet (122 cm). The DWCC houses about 20 whooping cranes. When we walked down the road towards their enclosures, we could hear loud alarm cries echoing from bird to bird, announcing something unusual in their world. We did not go in with these giant birds - these photos were taken through doors briefly held open by the crane keeper to allow photo opportunities. The centre also houses a few Sandhill Cranes that are used to incubate Whooping Crane eggs. One of the sandhills was rather obvious about what he thought of the intruders. Meet Doofus. 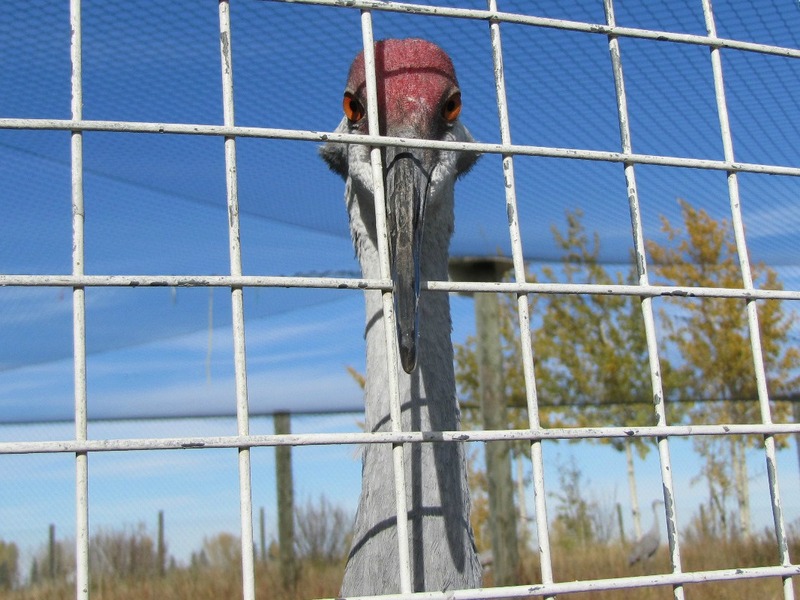 There was a female and juvenile sandhill in this enclosure, but there was no way Doofus was allowing anyone to get close enough to get their picture. That bill makes a formidable weapon, and he knew how to use it. The creation of Wood Buffalo National Park near the border of Alberta and the Northwest Territories was instrumental in preventing the extinction of Whooping Cranes, even if unintentionally. The park was established in 1922 to protect the wood bison herd, and at the time, no one realized Whooping Cranes nested there. Today, this 17,300 square mile (44,807 sq. km) park is the only place where a self-sustaining breeding population of wild Whooping Cranes exists. Access to the park is limited to water routes in summer and ice roads in winter. 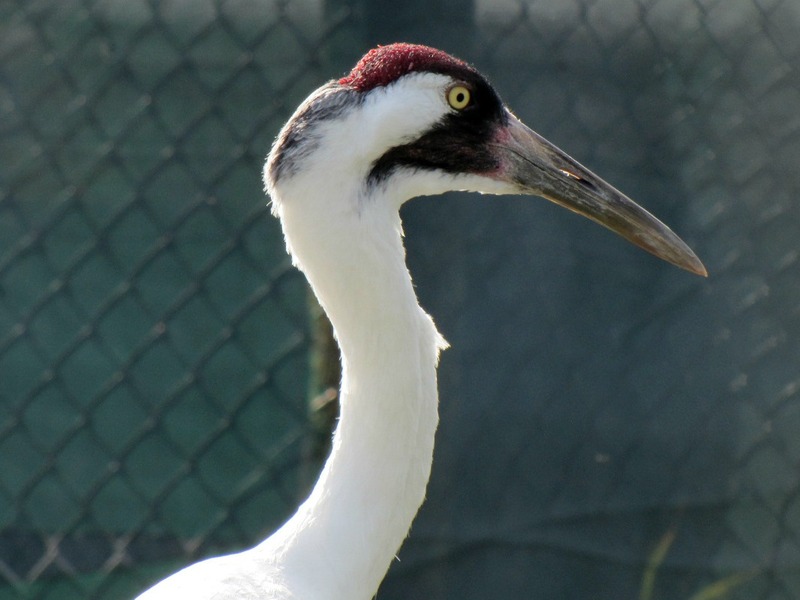 The breeding population of Whooping Cranes is now on the move to their wintering grounds. Whoopers don’t migrate in large flocks like Sandhill Cranes. They trickle out of the breeding grounds in family units, or small groups of sub-adults and non-breeders. By the end of September or early October the young birds are ready to try their wings on the 2,485 mile (4,000 km) migration to their Texas winter range. 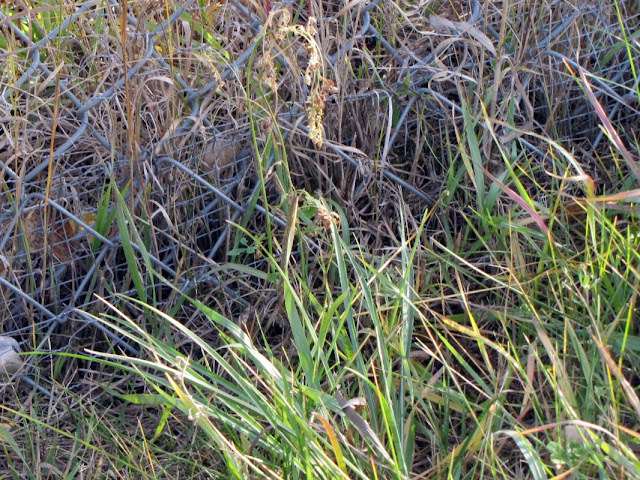 On the way south, the birds spend one to five weeks feeding in their staging, or stopover, areas in Saskatchewan. In these areas, undisturbed whoopers may spend the entire staging period on the same quarter or half-section of land. Here the birds fatten up on waste barley and wheat in stubble fields, and roost during the night in nearby wetlands. I count myself amazingly fortunate to have seen these glorious birds in the wild. I grew up in northern Alberta, and twice a year we were privileged to have small groups fly over the house. We could hear their haunting whoops long before we saw them, and those long-ago flights remain among my most treasured birding experiences. Very nice post and pictures Pat. I hope your birding time opens up some more. 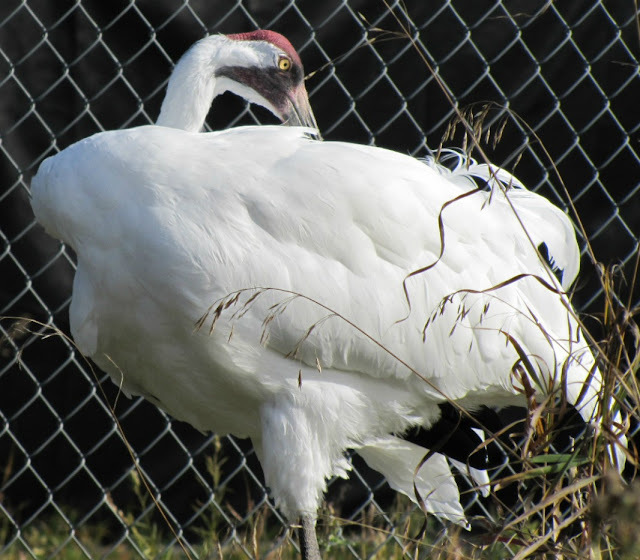 I've heard of Whooping Cranes but never took the time to look at a picture of one.Thanks for the nice photos. Pat, great post and wonderful shots of the Whooping Cranes. What a wonderful experience for you to be able to visit the Devonian Wildlife Conservation Centre. 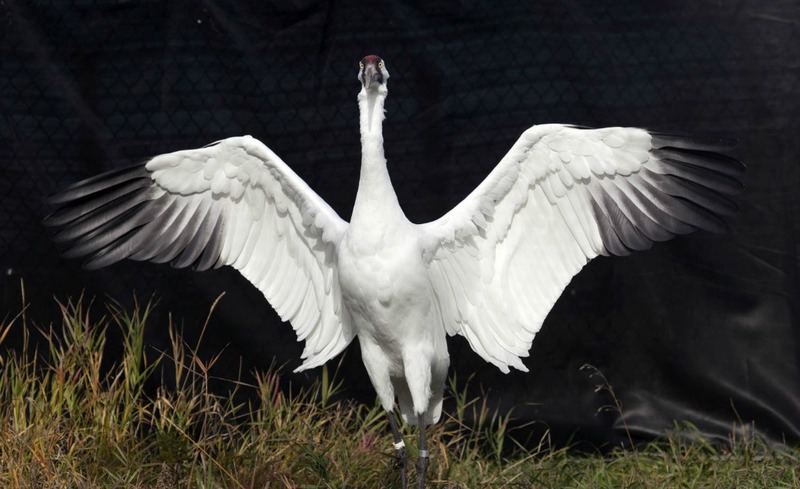 I have yet to view a Whooping Crane in person, but I certainly would love to. Fantastic post and photographs, Pat! Wonderful post! We had wild Whooping Cranes in New Mexico until the early 80's. I miss seeing and hearing them. Hope to see them in Texas this winter.